After past iterations in the Senate and House failed to gain traction, a bipartisan congressional team has reintroduced the aftermarket-focused PARTS Act, the senators and representatives announced Wednesday. The bill, known formally as the Promoting Automotive Repair, Trade and Sales Act of 2015 (Congress has been pretty clever with acronyms) would cut how long an original equipment manufacturer can enforce a design patent on a collision repair part from 14 years to 2.5. It’s being sponsored by U.S. Sens. Orrin Hatch, R-Utah, and Sheldon Whitehouse, D-R.I., and U.S. Reps. Darrell Issa, R-Calif., and Zoe Lofren, D-Calif. 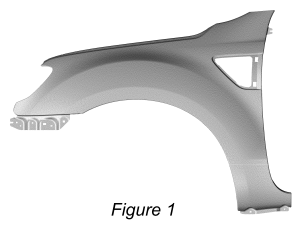 The bill would apply to external parts only — aside from airbags — and gives the examples of “a hood, fender, tail light, side mirror, or quarter panel.” That would seem to create a paradox where a design patent on a cup holder might be enforceable for far longer than one on a quarter panel. The PARTS Act, if approved, would still allow OEMs to sue competitor OEMs for design patent applications, according to the congressmen’s news release. So an aftermarket supplier could sell you a copy of the Ford fender above, but Chevy couldn’t. The proposed law only applies to design patents, not utility patents. The difference is form versus function. Utility refers to what you’d typically think of as a patent: A caveman invents the wheel. Design refers to patenting an object’s aesthetic appeal. A caveman designs a wheel with cooler-looking spokes. It looks unique, but it doesn’t actually work any differently than any other wheel. The Quality Parts Coalition, an aftermarket trade group, said in a news release Wednesday celebrating the bill that auto companies are using design patents to get around laws allowing aftermarket collision repair parts to be sold. It noted that the number of design patents has skyrocketed after OEMs unsuccessfully tried to get intellectual property protection for parts that’d be replaced in a repair. The timing is ironic, given increased media scrutiny from “Anderson Cooper 360” and others on whether insurers’ use of aftermarket parts to save money is resulting in lower-quality repairs. In fact, Whitehouse’s fellow East Coast Democrat U.S. Sen. Richard Blumenthal, D-Conn., has asked Attorney General Eric Holder to investigate the issue. The aftermarket industry disputes that their parts are of lower quality, and National Association of Mutual Insurance Companies senior vice president Neil Alldredge told “Anderson Cooper 360″ reporter Drew Griffin that “most” insurers don’t require aftermarket, repaired, or salvage parts, but when they do, the parts are cosmetic. He also said that often, aftermarket parts “are no different,” drawing a rebuke from Griffin.